Although the war ended in May 2009, the illegal journeys to Australia, either to seek refugee status or enter Australian soil through other false declarations, have not come to an end. In fact, according to the authorities, it is an ongoing crisis. 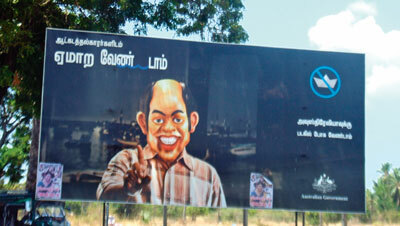 Local people confirm that large groups of persons who initially worked for the Tamil National Alliance (TNA) during the Provincial Council elections in the Eastern Province, have decided to undertake risky boat journeys to Australia, not knowing the weather conditions, not having necessary clothing and without knowing the duration of the journey. They were among the first batches to leave the country in desperation. “I was threatened during the election campaign and subsequent to the releasing of the election results. I have pawned my wife’s gold jewellery including her Thaalik Kodi (worn as a symbol of Hindu marriage) and paid Rs 1.3 million to the agent, to seek safe passage to Australia. I was among the first to be deported in November 2012. There is a Court case filed against us for seeking to leave the country through illegal means. So far, two hearings were held and the next hearing will be in December 2013. I am not aware of the time period a Court case may take or what the punishments would be. I am currently jobless and am unable to pay the interest to recover my wife’s gold jewellery. Fellow students tease my children asking, “When are you going to Australia, what did your father bring from Australia and why was he deported?” As a result, my children are refusing to go to school,” says a tearful Karan, who hails from the east coast of Sri Lanka, all the while, keeping a watchful eye on the surroundings. Karan is only one person whose plight after deportation is known. There are many others like him. 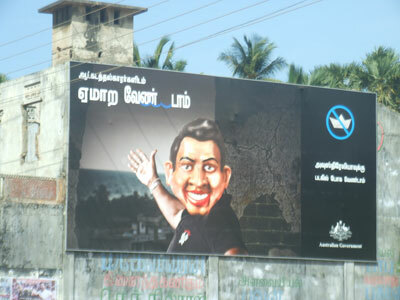 The Australian Government has put up hoardings in Tamil, both in the North and East of the country, warning people to not get caught to human smugglers – or those offering legal entry for a fee. There are also radio spots broadcast in Tamil very frequently. Small posters too have been put up in the North and East, warning people against human smugglers. Men in the former war zones don’t know much about the amended and toughened, immigration laws. They tend to view Australia as a ‘humanitarian country’ that would welcome and embrace anybody and everybody. “I am the youngest in the family and I have three elder sisters. My father was killed in the war and we don’t have anyone to support our family. I have to make a living somehow and give my three sisters in marriage, so I decided to give up my education and go to Australia to earn some quick money. I have pawned my mother’s and aunt’s jewellery and paid Rs 1.2 million to an agent who was trusted by many others. They were facilitated by this agent to leave the Vanni. I was nabbed together with many others, by the Naval officers off the Negombo coast, while trying to flee,” says Raj, a teenager from Visuvamadu in the Mullaithivu District. He cannot stop sobbing as he speaks. According to a recent survey, it was found that young men were more likely to take the risky boat rides than females. Further, the desire to migrate diminished with age. Relatively young persons have a greater desire to migrate than older men. Moreover, youths with relatively low levels of education showed a higher propensity to attempt migration, through whatever possible means. The survey sheds light on the fact that unmarried youths were more likely to attempt migration than men with families. The overwhelming factors driving migration and asylum seeking were the poor living conditions (74%) and lack of opportunities (41%). Thus, economic desolation was identified as the fundamental reason for migration abroad, even among ex-combatants. Insecurity is a minor factor driving migration abroad (only 18% cited). Greater proportion of youths living in Vadamarachchi North (91%), Thenmarachchi (87%), Jaffna (70%), Nallur (70%), Karainagar (67%) and Valikamam South (60%) expressed their desire to leave the shores, while youths in Valikamam East (9%) showed a much lower inclination to migrate,” notes Dr. Muttukrishna Sarvananthan, Development Economist and Principal Researcher of Point Pedro Institute of Development. As many as 6,400 people from Sri Lanka have reached Australia last year alone. Australia has recently introduced tougher immigration rules. Since August 2012, 1,000 Sri Lankans have been deported by the Australian authorities. “I have left the country for two reasons – I have helped the Tamil National Alliance (TNA) candidates during the Eastern Provincial Council (EPC) elections and have been threatened a few times by unknown persons in the area. I have a differently-abled younger sister who needs a lot of money for her medicine and upkeep. I have to bear the family burden. Although I am an arts graduate, I am unable to find a job, which can pay me well to look after my family,” says soft-spoken Balu, from the Eastern Province. These men who have embarked on a dangerous boat journey never paused to consider what could happen to them, if there is no welcome reception on Australian soil. The dangers of the journey were not considered, as they were driven by a desire to flee only. They often left with a pair of flip flops and a back pack, generally containing only a sarong and a towel. Some carried receipts given by some agents, while some had valid travel documents to seek asylum. They had a few wads of Sri Lankan currency notes along with their National Identity Cards (NICs) and laminated pictures of deities of their respective faiths, mostly Hindu and Catholic, in their wallets. These men who were deported in November 2012 claim that the officials have not gone through the documents properly, saying interviews were conducted in a rush and that the officers told them they were going to be transferred to another camp. Instead, they were deported. Karan and Balu left Sri Lanka in October 2012 and reached Coco Islands after spending 19 days in the sea, in a cramped fishing trawler, filled with 101 men in total – mostly Tamils – and without food and water for a few days. They were thereafter transferred to Christmas Island and to Darwin, before being deported. In November 2012, they were the first to be deported along with 50 men. Court cases have been filed against them and the first hearing took place in March 2013, the second hearing in August 2013, while the third is scheduled for December 2013. “With the war coming to an end in May 2009, it was expected that the outflow of refugees abroad would ease off. Though legal migration has declined since the end of the war, illegal migration continues unabated. It is suspected that a few thousand Sri Lankans are waiting in transit, in various countries such as India, Indonesia, Malaysia and Thailand, to primarily reach Australia, Canada and New Zealand. Enhancing the opportunities for livelihoods and improving the living standards within the former conflict zones could drastically reduce the trend. Given the local conditions, it will take at least five years to improve the living conditions of the population in Jaffna and other areas. There needs to be a sustained effort to improve the living standards of the people who have suffered the vagaries of war and to curb the trend of seeking asylum or migration, opines Sarvananthan. These deportees are also traumatized and stigmatized. They claim they are still under various types of threats, mostly political, and said their lives are in danger. They hardly go out or mingle with the others, except among the deportees themselves, and do not enjoy a regular life anymore. They are effectively isolated from their own society and most of them are unable to face the community due to debts, the illegality of their action, loss of wealth and property and mostly, due to the loss of dignity. Almost all of them have pawned their women folks’ gold jewellery to raise instant cash to pay the smuggling agents, and upon deportation, the pawning people have begun to warn these men, if they don’t pay the accumulated interest, their gold will be auctioned soon. These deportees feel ashamed and some have suicidal tendencies. For the Australian authorities, it is an issue that continues to grow. Hence the attractive hoardings. 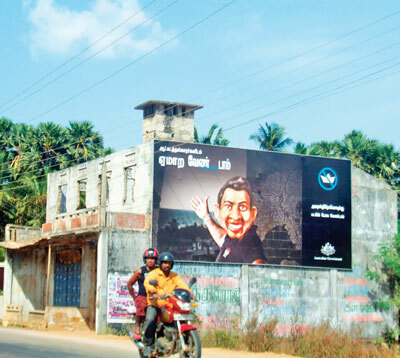 « Cabinet Minister Arumugan Thondaman of CWC Goes on the Rampage at Talawakelle Police Station.